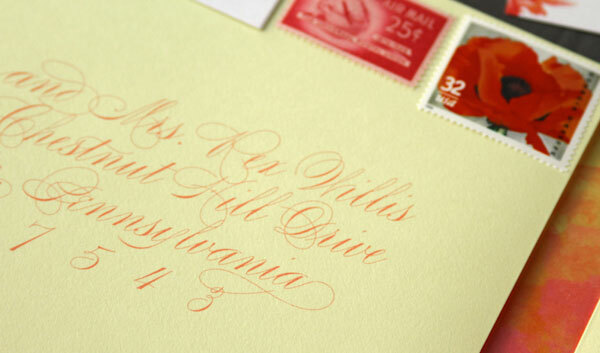 At first glance, Ann & Paul’s crush-worthy, custom wedding suite by Anticipate Invitations is the picture of elegance. 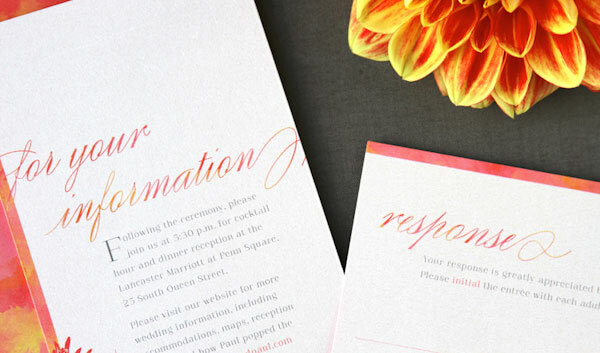 The beautiful invitations feature a warm and vibrant wash of watercolor, which carries through the suite in the upscale script typography, as well as in the lovely dahlia flower details. 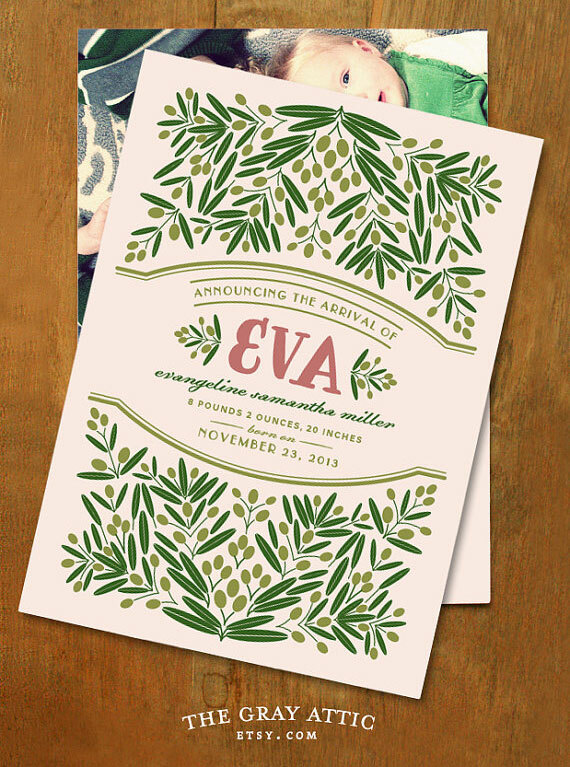 But the ultra elegant invitation suite hides an awesome detail in the form of some secret Star Wars action. Ann and Paul wanted something light and colorful with summer accents for their July wedding. In particular, they wanted to incorporate dahlias, their wedding flowers. Based on this inspiration, I came up with a playful and vibrant element using a watercolor wash in pinks, corals, oranges, and yellows. One particular design detail that stands out is the small, hidden Yoda silhouette on the leaves of the dahlia on the information card. This Star Wars character played a fun part in Paul’s proposal to Ann, so adding this prominent, yet concealed detail brought their story to the design. Not to mention, it was recognizable enough for other guests to be in on the secret, too! 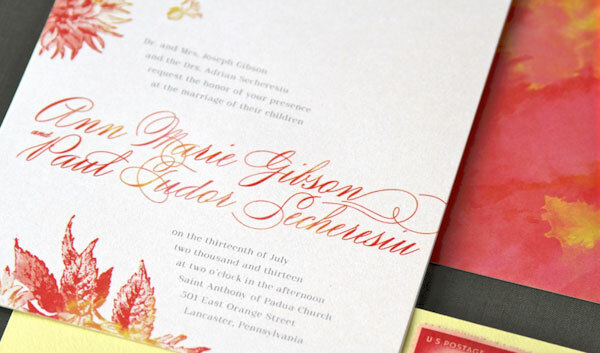 All of the invitation pieces were printed on white pearlescent paper to add formality and give the watercolor wash more dimension, which proved to be a great effect. 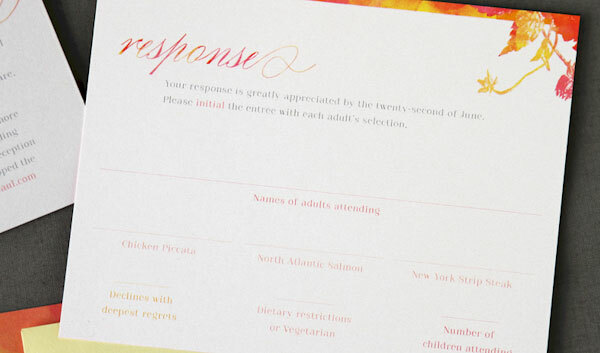 The design also showed a level of practicality in the form of a larger RSVP card for guests to initial their meal choice. This saved the caterer time because guest information was more organized. Can you spot Yoda below? 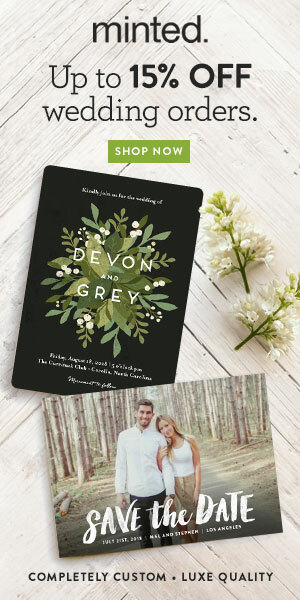 Crafty Pie Press recently added oodles of new wedding stationery to their website, and they’ve also added an e-commerce shop, so you can choose options like paper type, envelopes, colors, return and guest addressing and order samples and/or wedding stationery right from their website. 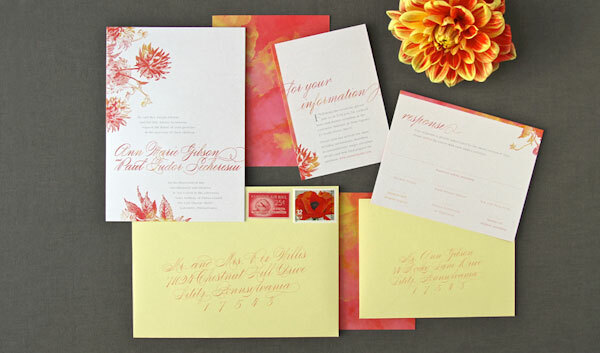 Have a peek at the new designs, which include styles that range from mid-century preppy to elegant, floral, and sunny. 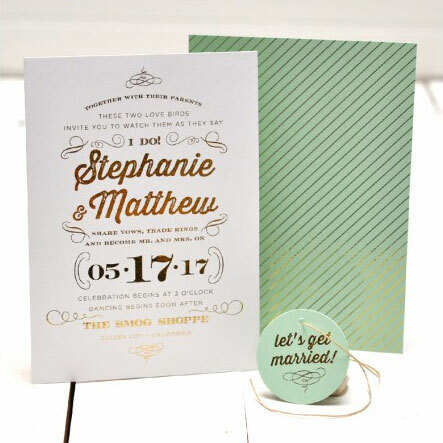 Coordinating patterned backers bring additional texture and depth to the designs, and coordinating save the date cards are available, too! We’re moving straight from spooky to a more winter holiday type of “spirited” with this fun bunch of White Elephant Gift Exchange , aka Yankee Swap or Dirty Santa or Machiavellian Christmas (that’s a new one to me), party invites. 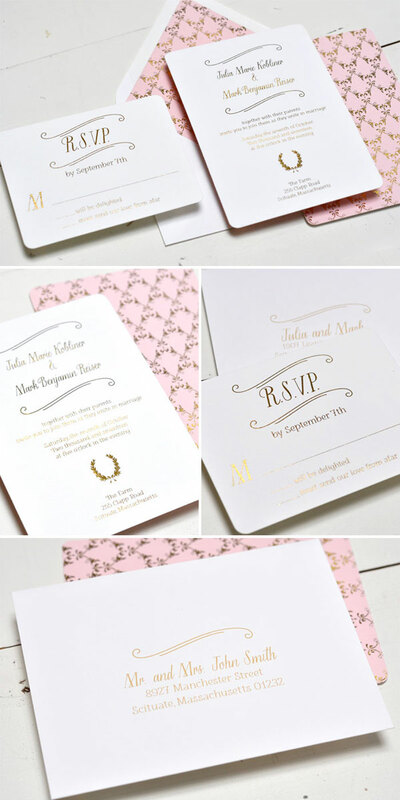 These often-held-in-an-office parties are lots of fun and often very humorous, and having a super cool invite to share with the invitees is just the icing on top! This post contains affiliate links. 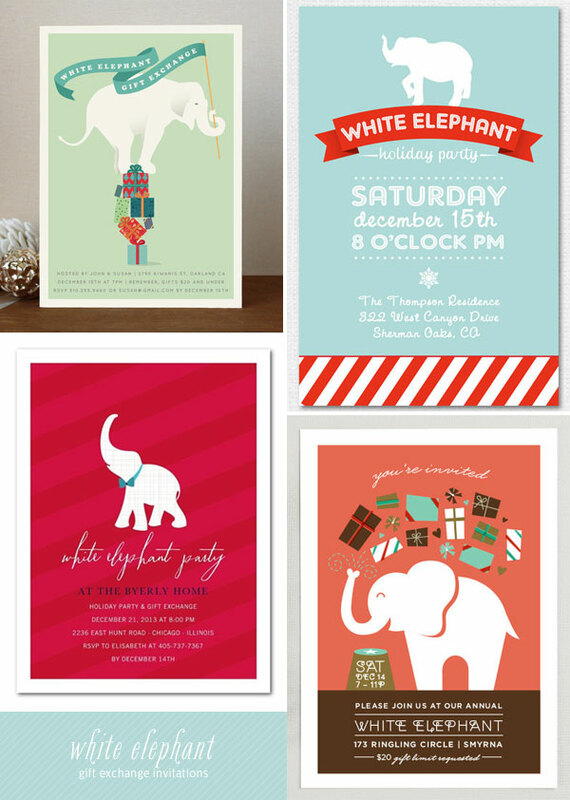 If you purchase through these links, you’ll help Invitation Crush, and you’ll receive some festive White Elephant Gift Exchange party invitations, too. Oh, yeah! 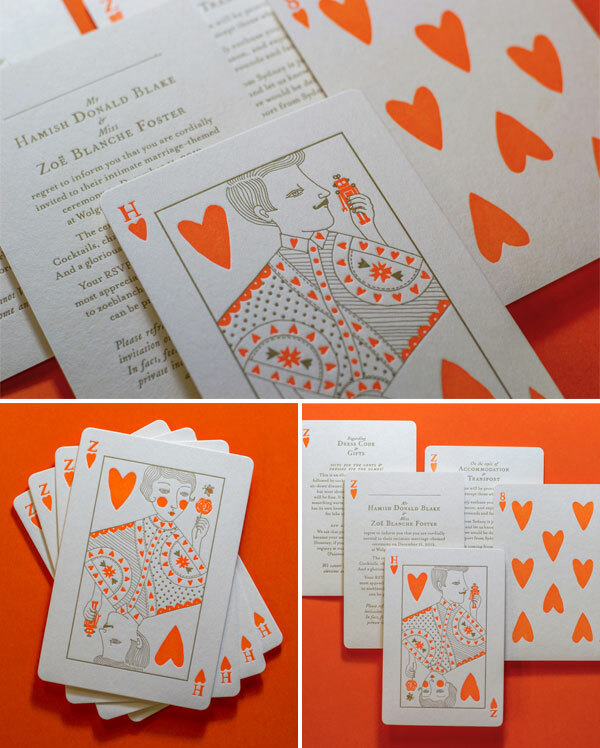 I love it when a couple steps outside the box and has some fun with their wedding invitations, and it was crush at first sight when I spotted these awesome (and clever) letterpress playing card wedding invitations recently over on Brooklyn Bride. 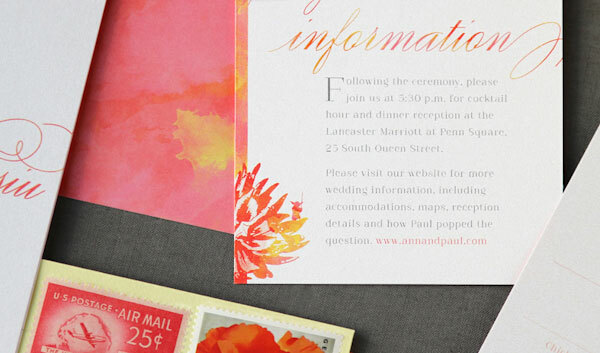 With fun wording, fantastic illustrations by Allison Colpoys, and beautiful letterpress printing in neon orange and gold by The Hungry Workshop, I don’t think there’s anything about Zoë & Hamish’s unique wedding invites that isn’t completely crush-worthy. This post contains affiliate links. 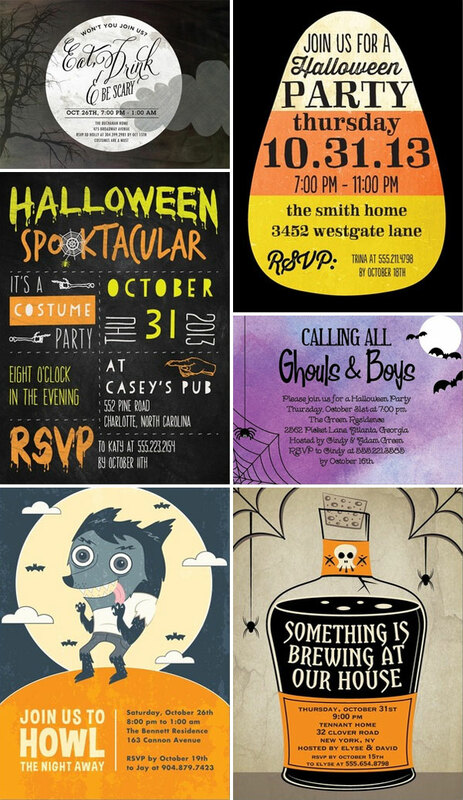 If you purchase through these links, you’ll help Invitation Crush, and you’ll receive some frightfully fun Halloween party invitations, too. Oh, yeah! I am such a sucker (pun most definitely intended) for all things Halloween, and these vampire-themed Let’s Hang Out … Forever! 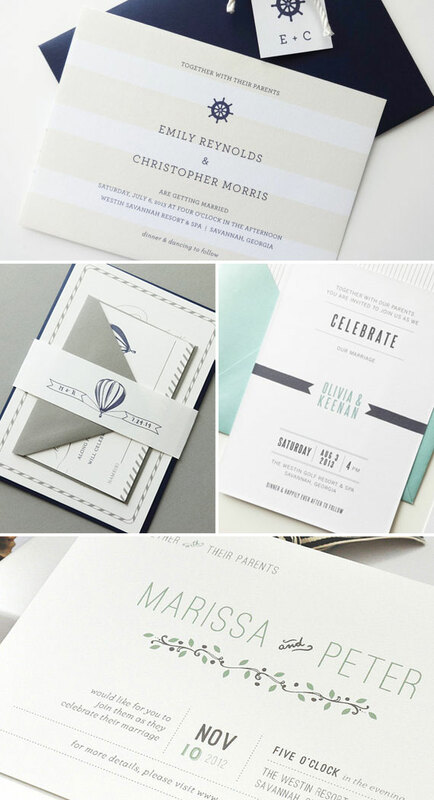 party invites by Amy Sullivan were an instant crush. 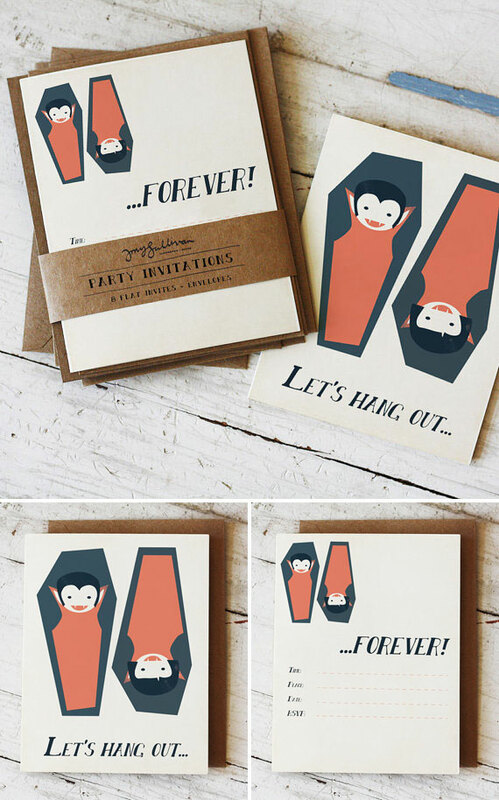 The sweet and spooky, two-sided fill-in Halloween invitations are the perfect way to lure your friends over for some bloodsuckingly good fun this haunting season. 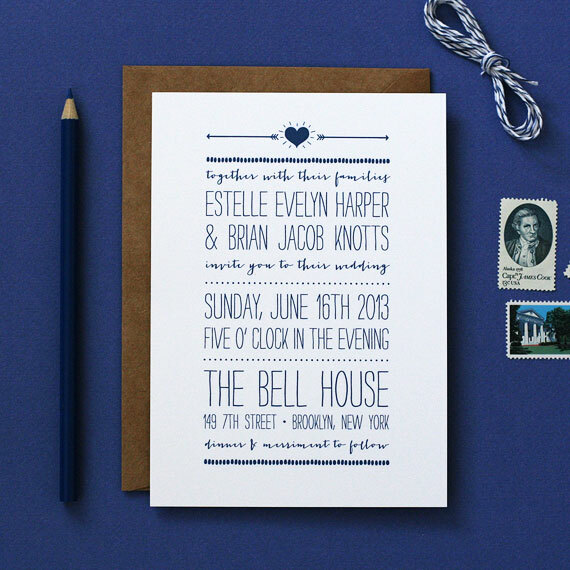 I am completely crushing on these amazing, hand lettered wedding invites and save the dates by Shannon Kirsten. 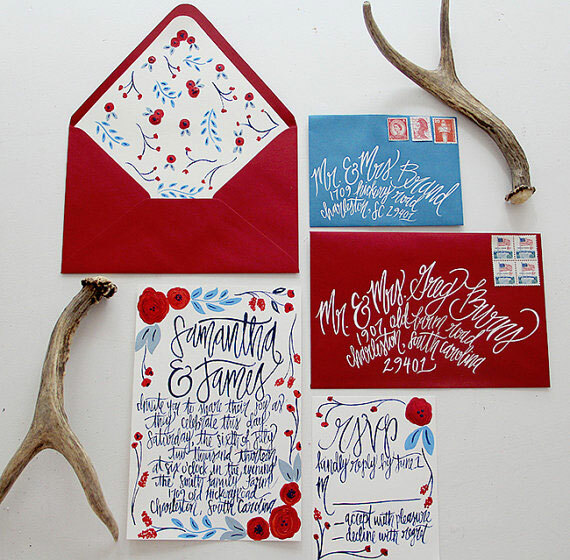 The swoon-inducing paper goodies feature Shannon’s dynamic calligraphy and hand drawn flourishes and illustrations, and each original design is hand painted in acrylic before being printed on premium linen textured cardstock. 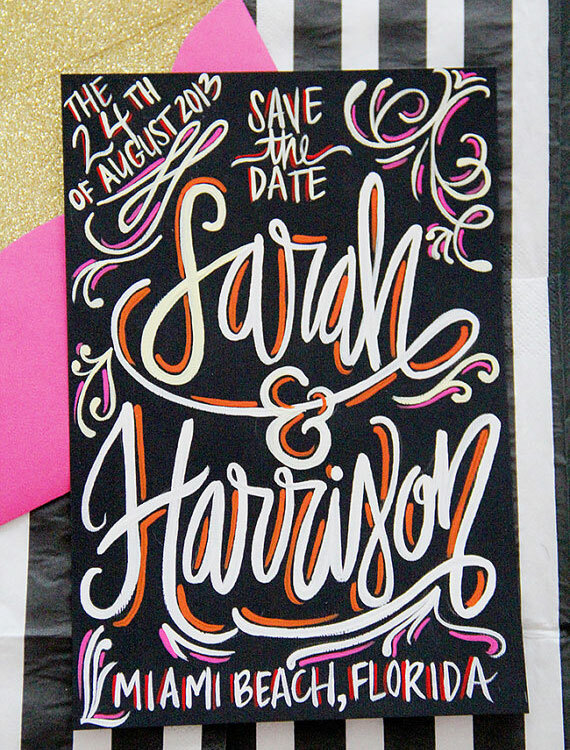 If you love hand lettering and are looking for unique, modern save the dates and/or invites, I think that you’re going to love Shannon’s work. 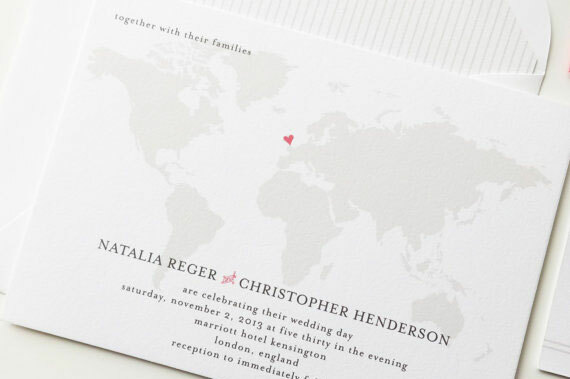 A Visual Concept has tapped into the stationery zeitgeist and created a collection of wedding invitations that’s sophisticated and modern, with a bit of prep thrown into the mix. 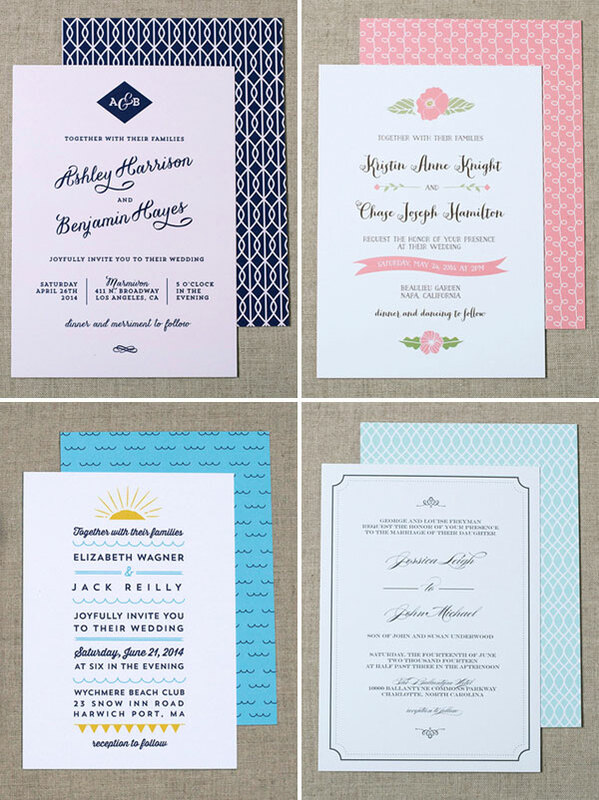 Whether you’re looking for nautical country club, earthy minimalist, or simply sweet, you’ll find a suite that suits you to a “T” among the lovelies in the A Visual Concept wedding collection. 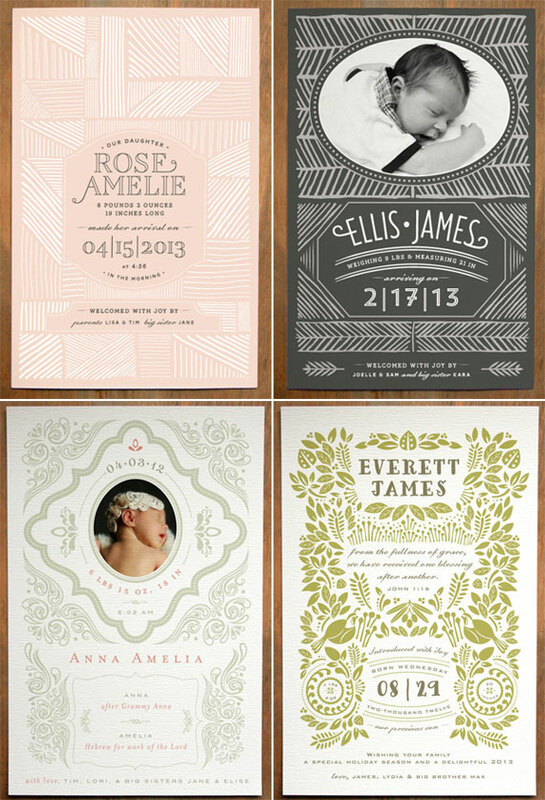 Here’s a little peek at some of the pretty designs, and be sure to check out the entire collection right here. 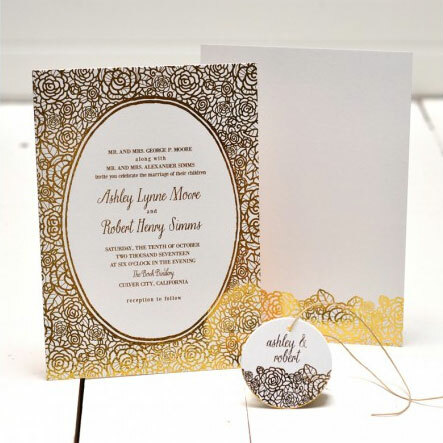 Looking for wedding invites that shimmer and shine? 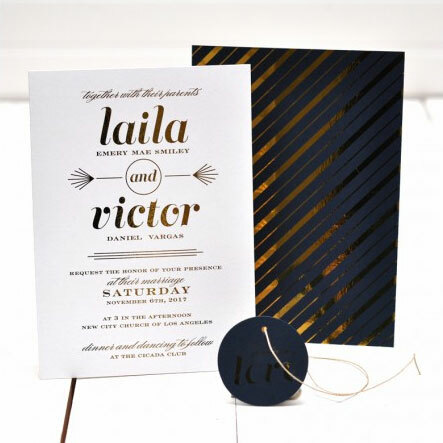 Check out this beautiful new collection of gold and silver foil duplex wedding invites from Smitten on Paper, which features sophisticated, modern designs like the Mini Wreath suite shown above. 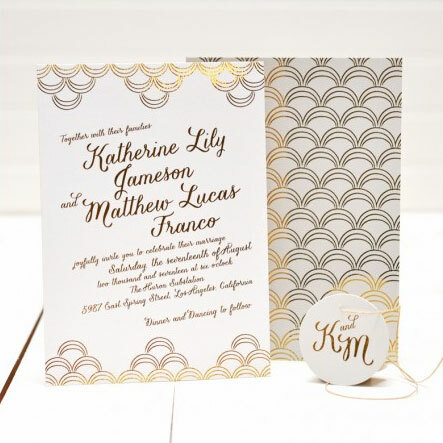 The gorgeous, golden (or silvery) invitations are foil stamped on both sides, with the occasion details on one side and a lovely, coordinating pattern on the reverse. Here’s a peek at some of the beautiful designs from the collection, and you can check out the full collection over at Smitten on Paper.